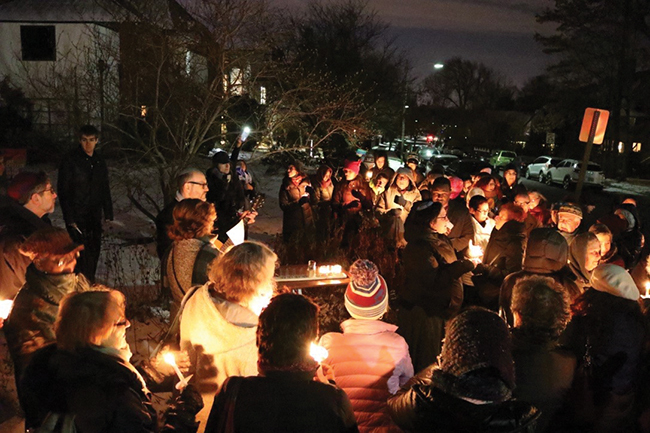 On the third night of Chanukah, the holiday celebrating the rededication of the Temple, a Montclair community dedicated itself to helping undocumented immigrants. During a ceremony on Dec.14, Rabbi Elliott Tepperman announced in front of a crowd of about 100 people that Bnai Keshet will serve as a sanctuary congregation, which will allow undocumented immigrants to stay on the temple property if they are in danger of being deported. According to the Migration Policy Institute, there are an estimated 11 million undocumented immigrants nationally; 498,000 of them reside in New Jersey, the fifth highest number in the country. In Essex County alone, the figure is 58,000. Bnai Keshet is one of three synagogues in the country to take such a stand, and in doing so it joins three other area houses of worship. It is the only congregation in Montclair, and possibly the first in Essex County, to offer physical sanctuary. Bnai Keshet is unusually situated in that its property is on the site of a former mansion, and until recently, the third floor of the original building was kept as an apartment. Although Tepperman said it needs some work, the space includes several rooms and a bathroom, with a kitchen elsewhere in the building. Traditionally, immigration enforcement agencies have maintained a policy not to arrest people in certain areas, including houses of worship. “So long as ICE [Immigration and Customs Enforcement] upholds that policy, people staying at Bnai Keshet will not be deported,” said Tepperman. The practice, however, is not law and more akin to minhag, or custom. For nearly a year Bnai Keshet has worked in partnership on this issue with Faith in New Jersey. The congregation helped organize a vigil on Tisha b’Av at the Elizabeth Detention Center this summer, among other efforts, and Tepperman gave his Rosh HaShanah sermon on illegal immigration. Members have already rallied in support of immigrants facing deportation and have taken part in training, provided by Faith in New Jersey, to be able to accompany undocumented immigrants to check-ins with ICE and document arrests and detentions. Bnai Keshet made the decision to offer physical sanctuary in the fall, and are supported in their efforts by two local churches, the First Congregational Church of Montclair and the Unitarian Universalist Congregation at Montclair, in every part of the process except the actual housing. 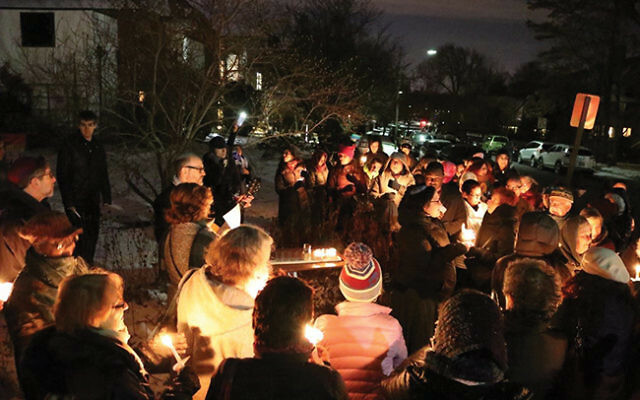 Together, the houses of worship formed the Montclair Sanctuary Alliance. Other Montclair area rabbis are also supportive of the effort, and several attended the Dec. 14 event. The churches’ support will extend to numerous fronts, including helping with fund-raising and publicity, and providing food and furniture — “whatever the needs of someone confined to the walls of the synagogue are,” as Tepperman put it. Bnai Keshet has also been working with the New Jersey Alliance for Immigrant Justice on this issue, and has received support from T’ruah, as well. Last week’s ceremony began outside Bnai Keshet. As they lit the chanukiah, Bnai Keshet’s assistant rabbi and director of congregational learning, Rabbi Ariann Weitzman, read a blessing she composed in Hebrew, English, Haitian/Creole, and Spanish that focused on the obligation to welcome the stranger. Everyone used the shamash to light their own candles in a ritual to practically and symbolically spread light. Then they retreated into the warmth of the synagogue. Archange Antoine, executive director of Faith in New Jersey, used the cold as a metaphor for the experience of undocumented immigrants. By the end of the evening, the participants, who came from a variety of Montclair synagogues and churches — and included some undocumented immigrants — according to Antoine, wrote letters to governor-elect Phil Murphy asking him to make good on his campaign pledge to make NJ a sanctuary state.